But if you ask those other early adopters out there, who’ve seen their work time devoured by Plurk, it’s a social network with a measure of charisma and style. The reason it is just so tempting to jump in head to feet with Plurk is because it doesn’t just offer the neurotic updaters of Twitter a chance to do their thing, but the media sharers of Pownce and the stalkers of Facebook to revel in interconnectivity and really a taste of every other fairly popular social website out there at the moment. It does not just do one thing – it does the thing: connects. And not only does it connect in efficient and easy ways, but it does so with a snazzy user interface that makes the bubbles of Twitter look like a crayoned list. And the system is thorough, down to the Karma points. Perhaps thrust into the social media eye by Reddit and Mixx, the Karma system encourages participation and continued conversation. But what about the spammers, you say? With any new network, inevitably comes spammers — but you have options! Don’t follow them! You can segregate Plurk friends by “Cliques”, sending only a specific group of people certain Plurks. Why Twitter never mastered that idea is absolutely beyond me. There doesn’t seem to be a limit to the number of Cliques you can create or participate in. This isn’t to say that Plurk isn’t lacking some features: The “unread reply” system can be quite overwhelming once you get a good little fan base going. You get alerted about a random reply to a thread posted 3 hours prior that you’ve already long forgotten. An ability to limit conversational alerts by length of time, user, or even (especially) manually by specific thread would be most satisfying to eliminate discussion not necessarily relevant to you. There is a “mark all as read” feature (a la Google Reader), but that doesn’t give me quite enough control; especially if you have 100+ messages pending, some of which may be important to look through. Other tweaky little feature opportunities (which could be added as high Karma bonuses) are geolocation, the ability to have multiple expanded conversations open at once in the same window, a Firefox Add-on, et cetera. Within a few short moments, several people, including myself, started playing word games with the name. So we were Plurking all over people, Plurkaliscious, Plurkoids, Plurkitudinal, as well as being Plurked off, fairly Plurkificatious and Plurkified with joy. You get the idea, right? 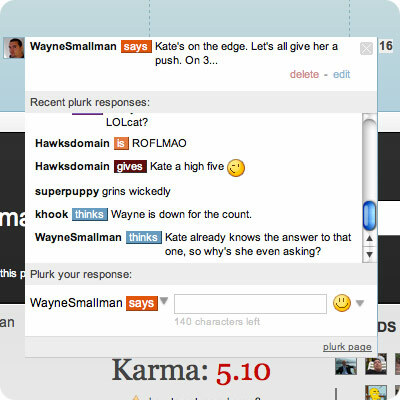 Oh, the possibilities with Plurk! Like nearly all new social networks, they bring with them new concepts. One such concept that struck me was the possibility of actually being able to start a meme and watch it fan out across your friends list. Physically watching an idea grow and propagate out across your lifestream. In fact, that’s exactly what happened earlier today. Quite unlike Twitter, user names don’t take up the text allowance in messages. Messages (or Plurks) allow for a variety of different message types, not being restricted to what you’re actually doing. Use of a time line, that runs horizontally across the screen, with the past to the right. Support for YouTube, Flickr, Photobucket et cetera, all within the timeline frame. A really slick Private Messaging system a la Facebook style; also when you hover over a Plurk, you’ll see a downward triangle beside the persons picture / name, which gives you a Private Messaging option. 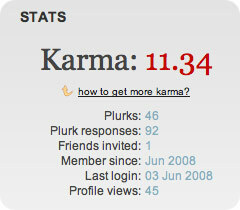 Plurk uses Karma as a metric for people’s activity. As your Karma increases, more options / features are made available. It’s possible to use Private Messages in a Plurk page as a separate conversation window, without the time line. It’s possible to edit Plurk messages, but not replies. There’s a mobile option, which will be interesting for some. There’s a bug with the Alert count, where it shows something’s there, but when you click there isn’t. As more people come on-line, the whole thing begins to creak quite badly, taking ages to load. Plurk is new, so we’ll allow for these things for now. It’s not possible to have multiple conversations open at once. Could maybe benefit from a Firefox Add-on, or a desktop client application. 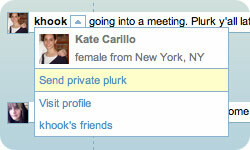 As a social network, Plurk has huge potential. But that potential is potentially locked up elsewhere, on other services like Twitter and Pownce. My big social web app’ wish list! And your favorite Social Network is? Nicely summed up dear friend!!! Unfortunately, getting work done on that fun interface is incredibly difficult – had problems getting de-addicted!!! ANd yes the unread responses pile up if you have a lot of following!!! Like the station though – its NICE!! Awesome! I will have to link to this in the future. I just wrote about Plurk yesterday on my blog, but this is fantastic. I love reading everyone’s different responses to it. Great summary, although I have not noticed the problem with the inaccurate replies count. But I haven’t counted them, either! Great overview! Interesting you didn’t really discuss the karma system. I think there are definite cons to using a points system to encourage user participation and activity. I think the biggest drawback is “low value” or spammy Plurks and friends requests as people try to increase their Karma scores. I still really enjoy this one and I’m eager to see how it does. Time will tell how well it holds up under the load of new users, it’s handled a pretty major influx this week with reasonable agility so I’m feeling positive. Interesting. I’ve been ignoring Plurk, but you made it intriguing. I may have to check it out. I like Plurk, but I think my biggest gripe about the service is that there isn’t a way to import your Plurking Twitter contacts. Other than that, I’m really enjoying the interface. I have just read your article about Plurk and I think that I will practice it in the future. I’m interested in it. Let me know about anything else which is connected with Plurk. Cool article, but I like Twitter more Plurk. My friend and me don’t move to Plurk now. You know I have heard a lot about these short messages called Plurks. As for me for all this time I’m still using Twitter. It was very interesting for me to read everyone’s different opinion. And I think you have chosen a perfect way to follow the events of the people that matter to you. Thank you very much for your article and I think that your information will be useful for my job. Before I and my friends we used to use Twitter for this functions. Now we have started to use Plurk. I have also started working with Plurk, and I must say that is a good piece of software (webapp), but I can use some improvements. I like your article and I like Plurk. I’m really enjoying the interface. Let me know about something new. Thanks for this information. but if it doesnt let me plurk more than 30 a day..
hope u guys gona let ppl plurk more than 30 a day..
I’ve been using Plurk, Twitter, and Jaiku, and I have to say, i find Plurk to be the most interesting of the three. The reply function is much easier unlike in Twitter where I don’t know which of my updates my friends are replying to! Plus they allow for a CSS layout which allows you to change it any way you want!